When I created this blog I did so with the intention that it would have several functions; to act as a webpage where people could view my current and previous work as well as my CV, a platform from which to reflect and write critically on arts exhibitions, events and books and also become an online sketchbook in which I could collate images of other artists work as well as text/quotes from other inspirational sources. This post is the latter and is hopefully the first of many more snippets of things which are interesting and may be influencing my practice. I discovered the piece, 'Tools' by Mao Tongqiang in a sculpture magazine that eventually found its way into the art office about three months later than it should have. Still, luckily for me, this meant I came across it just recently. 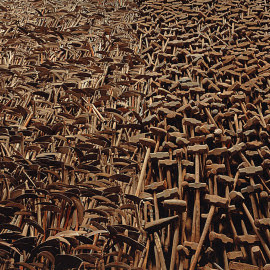 "Tools" (Gong Ju) by Mao Tongqiang consists of over 30,000 pieces used sickles and axes (and hammers) that the artist has collected across China in over two years. In terms of the context of the work, the most fundamental nature of these sickles and axes is working tools, the symbol of the farming civilization that had been dominant over thousands of years. If we look at these tools from a historical or sociological perspective, they were also the most primitive weapons in countless peasant revolts that marked the changes of dynasties in feudal China. In the modern history of Comintern (Communist International in Soviet Union) and the Communist Party of China, sickle represented peasants and axe (and hammers) workers. It’s the union of the two groups that led China into victory in the Communist Revolution in the 1940s, who also constituted the fundamental force of Socialist Construction afterwards. So it’s not surprising that the flag of the Communist Party adopted a pattern of sickle and axe, which illustrates the symbol’s significance and value." Initially I was drawn in by the obvious connection in similarity of subject matter, 'Tongqiang uses tools, I use tools.' Both of us completely different in our approaches and how we actually use/then present the tools which is also exactly why I'm interested in his work. I've never attempted to use tools as an installation/scultptural element before and equally I have never looked at the political connotations that my selection of tools may have (particularly hammers, which have quite significant associations with 'law/order', buying/selling, Communism). Similarly, ideas around repetition, layering and how the work is poignant to its context (of the country/as well as the architecture of the room its in) are also food for thought. Formalistically speaking I also get quite excited by the shapes and consistent and subtle tonal palette of browns. All of which gets me thinking about how I might approach new ideas to forming work. Ie. Maybe layering, selecting tools that have paritcular significance/association to an idea/site. The work, 'Tools' was recently exhibited in an exhibition, 'Real Life Stories' (In Bergen, Norway) featuring a collection of artists, selected and curated by Ai Weiwei. That in itself is also quite revealing, as I thought of Weiwei when I saw the image below, as it reminded me of his piece in the Tate Modern, 'Sunflower seeds'. 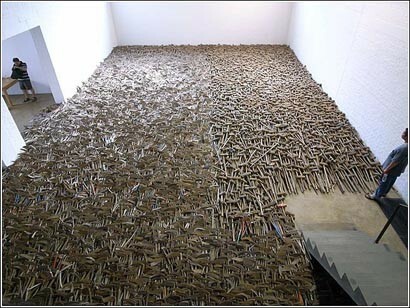 There is a pattern emerging it seems with Chinese artists making work that is comprised of thousands of individual components (be it seeds or tools) that are viewed both individually and as a mass at the same time. I am thinking that this is a referent to the ever increasing population of China and that, whilst each (seed/tool) is different in the eyes of a communist, political regime it is really only about the majority and 'might' of the greater whole. 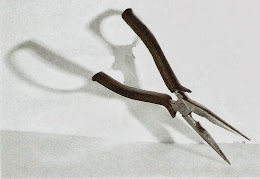 Similarly the association of tools with labour/work and the way in which labour (in the form of craft) also played a significant part in the making of Weiwei's sunflower seeds is indicative of the work ethic and striving for development and prosperity that is particularly present in Chinese culture.